Despite having in excess of one billion adherents globally, many people in the Western world know very little about Buddhism. Perhaps with the exception of having heard the name of the Dalai Lama, the same can equally be said of Tibetan Buddhism, perhaps more so. With misconceptions and a lack of knowledge being so prevalent, it is always heartening to have an opportunity to convey some of the rich spiritual life that Buddhist philosophy presents and perhaps dispel a few myths also. 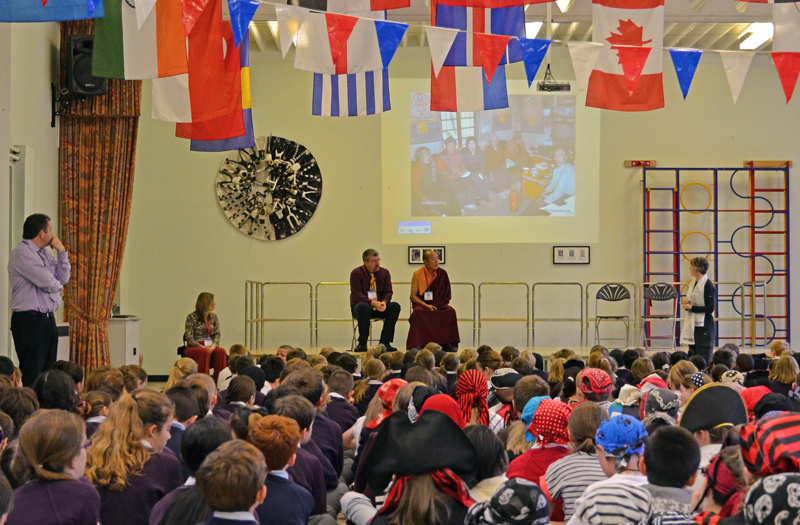 Morning assembly with a Tibetan Lama and a few pirates! Just such a rare opportunity recently presented itself in Liverpool this week when Lama Lhakpa Yeshe was invited to address the Sudley Junior School as part of their morning assembly. Initially it was planned to give a short discourse about Buddhism, Lama’s life in Tibet, monastic activities and so on, but in a typically spontaneous manner it was decided instead to first of all answer any questions the children wished to ask – and ask they did! The children at Sudley proved to be an intelligent and inquisitive bunch; asking a wide variety of questions which Lama enjoyed responding to immensely. 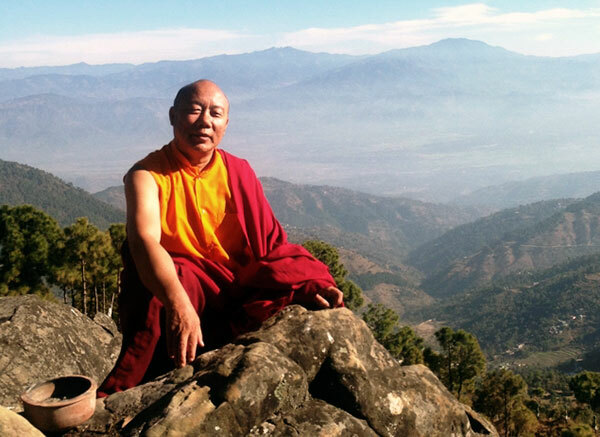 Lama was questioned about his monastic robes, life in the monastery, his age upon entering monastic life, how long he stayed in the monastery, how he arrived in England and many more things. The allotted time flew by and it was quickly time to say a few final words before the children left the hall to start the first lessons of the day. Lama and the Sangha community consider the day a great success and we all enjoyed our visit very much. We would like to offer our thanks to the Head Teacher, Deputy Head Teacher and all the staff at Sudley Junior School for extending this invitation to Lama to come and address their morning assembly. 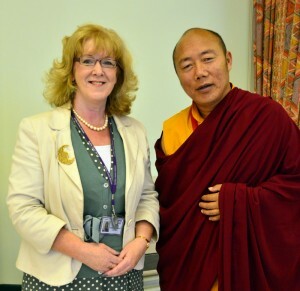 We would also like to offer special thanks to Mrs Garvey both for her initial invitation and her invaluable assistance in preparing a Powerpoint presentation showing the children where in the world Tibet was, as well as familiarising the children with images of Buddha Shakyamuni and His Holiness the Dalai Lama. This presentation gave the event an added depth by providing context and additional images which we feel were invaluable. 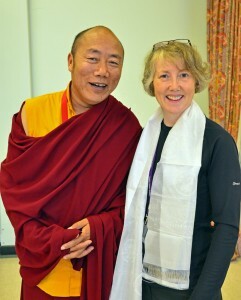 In honour of her work in making this event possible Mrs Garvey was presented with a traditional Tibetan khata which is visible in the above picture.